This Fall, we sponsored a young girl, Ashlyn, at the Payette County Fair for her market Goat. Ashlyn brought us this very creative gift as a Thank You. 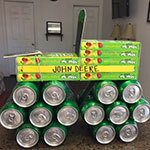 It’s a John Deere Tractor made out of Sprite cans and boxes of Mike & Ike candies. Very cute!